Germany is a bread-loving country and its bakeries produce hundreds of varieties. Here are authentic recipes for 10 of the most popular German-style breads. Many of the doughs are left to ferment overnight to enhance the flavor and baking properties. With a little planning, this takes no extra hands-on time and results in a superior loaf. The ingredients are simple—rye flour, wheat flour, yeast, water, salt, a sour, and sometimes seeds—it's how they are mixed and in what proportion to each other, as well as how they are shaped that gives each type a unique character and taste. This bread's flavor is enhanced by the addition of 1/4 cup sourdough culture to the baker's yeast which is used to help it rise. This German bauernbrot or farmer's bread is a half-day project. To get the hard crust, use steam in the oven. This bread is surprisingly easy to bake at home. It is made with 100 percent rye flour and rye berries with some sunflower seeds and fermented with sourdough. Vollkornbrot is loved in northern Europe, especially Germany and Scandinavia. Learning how to bake this bread is well worth it for the wholegrain bread lover. If you are looking for a dense, whole-grain loaf, this one is about the closest it comes to tasting like a German bakery bread. Based on Peter Reinhart's Whole Grain Bread book, it uses 100 percent whole grains, along with pumpkin, sunflower, and sesame seeds for a dense, moist loaf. This weizenmischbrot or light rye bread is made with 45 percent rye flour and 55 percent white flour with an overnight sponge and sourdough starter. A strong aroma and pleasant sour taste make this dough traditional. Turn it into rolls or a loaf, whichever you prefer. 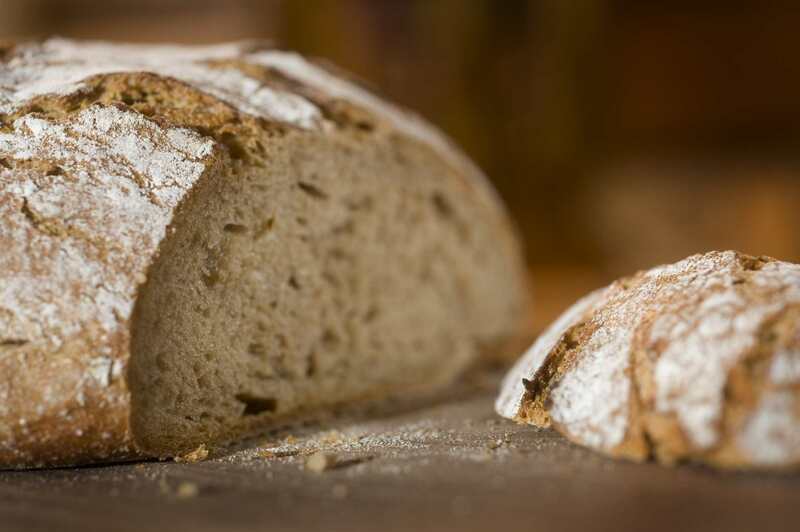 You also might like graubrot, a whole-grain light rye bread made with an overnight sponge. Although this is not a German bread, it is found in Turkish stores and kiosks all over Germany. Fladenbrot is a flat white bread, covered with nigella seeds, and has a particular taste not found elsewhere. It can be round or elongated and is simple to make. This bread is related to the Italian ciabatta and calls for an overnight sponge. It's delicious with tzatziki. Another delicious German white bread is kartoffelbrot or potato bread. Now you can have authentic brezeln or pretzels outside of Germany with this recipe. The dough is easy to make and the only tricky step is the lye bath, using food-grade lye. No matter what anyone says, you cannot get the same taste without it. This bread is a 20 percent rye mischbrot, or mixed-flour, sourdough bread, very common in southern Germany. Chewy, but light in flavor, it has all the characteristics of typical German brot. Sweet fillings like jams and fruit are very common in German sweetbreads, and most are flavored with vanilla and lemon zest. They run the gamut of a braided sweet bread made with white flour or whole wheat to sweet giant pretzels and Danish pastries. For breakfast or brunch, there's no treat like fresh German hard rolls known as brotchen. Also known as wecke or semmel, they are to Germany what croissants are to France. Other popular buns include sunflower seed rolls made with rye and white flours and a little sourdough and wreath-shaped breads that are popular for parties or other celebrations. Indispensable for breakfast are milchhornchen, similar to a soft butter yeast roll. If you are a fan of oatmeal bread, this is the recipe for you. You can enjoy it made with white flour combined with whole-wheat flour or with 100 percent whole-wheat flour. The whole-grain version does best with an overnight rest in the refrigerator, while the regular version takes just three hours from start to finish. Try both and see which one you like better. Which Is Cheaper: Buying Bread or Making It?